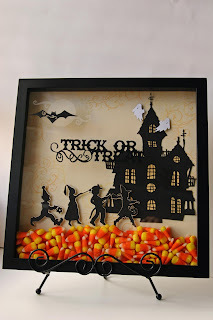 Liz's Paper Loft: Trick or Treat Shadow Box! Good morning to all my spooky followers! It's the "Fun~mare Before Halloween" Blog Hop! You should have arrived from Linda at Krazy Quilling, she is super creative! To start from the beginning, go to Jess at Kinder Stampo...there is lots of blog candy give aways going on so be sure to check out all the blogs along the way! Now on to my project...I've seen a few of these types of pictures going around, so of course I had to add a twist or two! It's hard to see but I added glass etching for the moon. And of course Halloween wouldn't be the same with out my favorite...candy corns, which are under the glass. I hope you enjoy and get some ideas so you can create your own! after I did mine I thought of this~ etch the inside part of the glass, it seemed to show up better. I was unable to turn the glass around or I would have. Ok your next stop should be Madison Funky Cards...I can't wait to see what she'll come up with! If you get lost along the way, the list is right here for to get back on track! Oh Liz this is absolutely wonderful! Love your spooky frame and the etching is such a great idea and the candy corn inside the picture, this is such an awesome project and so creative! i love this idea!!! i am not a candy corn fan but LOVE it in your frame!!! I love this picture! I have not seen one of these before and it is adorable I think I might have to scrap-nap it! Thank you for the inspiration! This is amazing, love the glass etching....super job...have a great day! I really like this idea, don't know if I could leave the candy corn. the glass etching is a very nice touch to this. Oh I love that old haunted house! Etched moon is really cool! oh wow this was so amazing it just blew me away the creativity that is out there. Thank you so much for sharing. LOVE, LOVE, LOVE this!!!! The candy corn is such a clever addition! Makes the whole project! This came out beautiful in a haunting kind-a-way lol. Very creative. Cute frame--I purchased a frame like this with little hearts "floating" on the bottom. Liz, you alway have the BEST projects! I always love coming here to see what you make:) I am so excited, I'm going to try and get the banner made this weekend. This is wonderful. First time I've seen something like this. I'll have to try it. That is so creative!!! Great idea. This project is AWESOME!!! How cute is this!!!! Just love it. Thanks so much for sharing. OMG this is sooo freakin' cool! LOVE LOVE LOVE it!!! Absolutely amazing ! Martha C.
How cool is that! I love the added candy corns! The whole thing is just gorgeous! What a cute home decor piece! The candy corn colors really make it POP! TFS! OMG! I love it! The candy inside is perfect! Very nicely done! Oh my goodness. This is so beautiful. I really love it. And I want it on my wall! You did a fabulous job! Thanks for sharing. I enjoyed your project so very much - thank you for sharing your project. Love this idea and thank you so much I have a shadow box my DD keeps picking up and saying "Mom what are we going to put in here". And you just helped me figure that out! TFS! I so love this picture. Thanks for a fun day of hopping! Cute idea with the picture!! What a great project. Thanks for sharing a creative project. Wow...you did a beautiful job! absolutely amazing! I would have eaten the candy corn! Thank you for sharing! This is amazing! I love this and you've made want to give something like this a try. So great! This is an awesome project! I love how it turned out. Nice project! Thanks for being in the hop! that is a really cool project. love the candy corn. This absolutley BEAUTIFUL!!! I love it! I love it wonder if I can find a frame like that now. This is so cute! We love candy corn here so much that for the kids can scrap tag swap I am putting on my daughter is making her tags in candy corn shape and colors! thanks for sharing, your etching is a lovely touch. this is just AMAZING... i love it! Love your project! You could use make one of these for jus about any Holiday! Thanks for sharing! This is a FAB project! Pat yourself on the back!! That is a really great idea! I love seeing the candy corns. Thanks for the hop! I love this shadowbox picture! I havent tried etching yet but love the way you did your moon using this technique! I do like the diet frame...the candy corn is a great color piece. GREAT project--yum. .. candy corn! Oh wow! Your frame is amazing. Love the extra touch of the candy corn and the frosted moon. TFS and for a chance to win. OMG girl this is freaking adorable!!!! Ive never seen this done before it is soooo cute! I will have to "lift" this idea for nexxt year LOL!~!!! Really cute! I love the candy corn in there!! Miss Liz...you are one talented lady. I love your project. TFS. Liz, I think this is my fave project so far!!!!! This is beautiful!!! Ok, this is just TOO CUTE! Love the idea!!! Would probably eat too many candy corns assembling it though, LOL! This is so very nice and I may have to try one of these, what a good way to always have some candy to look at. Thanks so much for sharing with us. this is fabulous - I have ACY and love what you did with the candy corn. I am not sure what you meant by the etching... what image would be etched? Is the saying? oh my goodness this is so freaking cool!!! That is so cute and the etching.....what a great idea! TFS! Prettiest piece on the hop so far. I absolutely adore this one. Thank you for sharing such a beautiful piece of art with us. Awesome project. I love the glass etching. This is TOO WICKEDLY COOL!!!! Oh my goodness, this is so great. TFS. Liz you are AMAZING - I love seeing your projects - great job! What a fantastic project. I love the different layers and especially the color "pop" of the candy corn. I couldn't tell did you also make the kids in the vinyl or just the bat and trick or treat? Anyways, its a WOW!!!! This is a really cute idea!! So glad I decided to participate on this blog and even happier that YOU did! LOL Thanks for sharing your inspiration with us. very awesome.. thanks for sharing! What an awesome project, thank you for sharing. Wow! So far this is my favorite project! Thanks so much for the inspiration! This is just fantastic and so innovative. You ROCK! I loved this Liz!!!! The candy corn looks really cool. What a great idea. I adore this, I seen it earlier and had to show the kids! They adored it! TFS! Just finished my project based on your design. It looks so great! Thanks for providing the details. It was very fun to make, and is a very creative design! Just finished my version of your Shadow Box. Thanks for the great inspiration! I want to make this, can I buy the vinyl from you already cut into the bat, kids, house, or can you direct me to where i can buy it. Happy Halloween ~ It's almost over! OOPS! I Missed a few days! Scrappy Mom's Stamps Day 7 of Sneak Peak Week! Scrappy Mom's Stamps Day 6 of Sneak Peak Week! Scrappy Mom's Stamps Day 5 of Sneak Peak Week! Scrappy Mom's Stamps Day 4 of Sneak Peak Week! Scrappy Mom's Stamps Day 3 of Sneak Peak Week! "PROJECT A DAY" for the month of October, Day 15! "PROJECT A DAY" for the month of October, Day 14! Circle Blog Weekly Challenge #2: THINK PINK! "PROJECT A DAY" for the month of October, Day 12! "PROJECT A DAY" for the month of October, Day 11! "PROJECT A DAY" for the month of October, Day 10! "PROJECT A DAY" for the month of October, Day 6! "PROJECT A DAY" for the month of October, Day 5! "PROJECT A DAY" for the month of October, Day 4! "PROJECT A DAY" for the month of October, Day 3! My Pink Stamper ~ Spooky Challenge!